Yesterday I gave eight reasons for trying alternative window managers. I even suggested installing twm to see what Linux looked like more than a decade ago. I suppose that most of you did not bother to install this relique of last millennium just for fun. So here the obligatory screenshot of the window manager originally released in 1988! Tab Window Manger a.k.a. 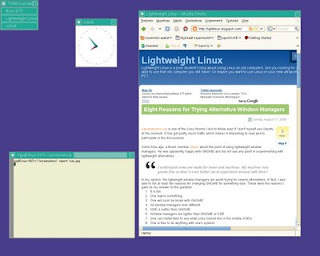 Tom's Window Manager provided windows with title bars, something resembling icons (see the top left corner) and configurable key bindings. But no wallpapers or virtual desktops or other modern sugaring like widgets for closing an application. Configurability and theming is kept to the minimum. One can change the fonts and colors but not much else. If you have a computer with Pentium processor I would suggest you to use any other window manager. twm is made of win, and so is vtwm if you must have a virtual desk (it's not the same paradigm as 4 virtual desktops, rather your screen is just a magnifier on the the desk). And read the documentation. The configuration file is easy to understand if you do so. You can make custom widgets and add them to the titlebars. You can get rid of the titlebars and use a single pixel border ala evilwm or Larswm. You can change the icons for iconified apps. Twm isn't hopeless. it actually is quite configurable.